Why do some neighborhoods improve more than others? (Tech Xplore)—Researchers have put classical theories of urban change to the test with help from Google Street View and computer vision algorithms. 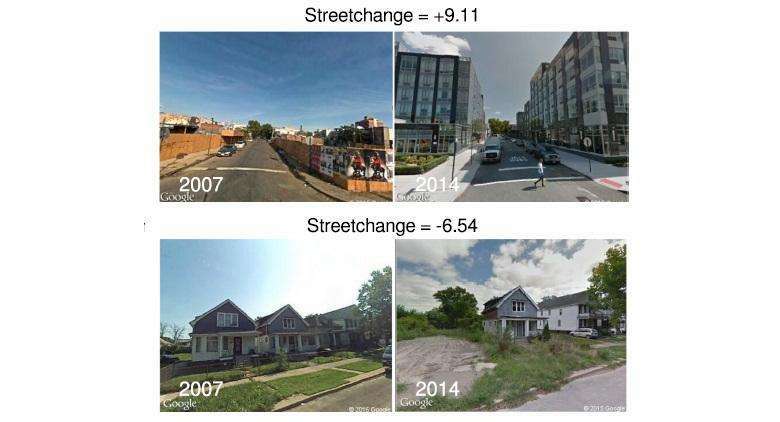 By comparing photos of the same locations from 2007 and 2014, they identified connections between the changes in the physical appearance of a neighborhood and the neighborhood's economic and demographic data. Overall, their results support several theories of urban change and show that a variety of factors—especially population density and level of education— contribute to the changes in neighborhoods over time. The researchers, led by César A. Hidalgo at MIT's Media Lab and Harvard University, have published a paper on the use of computer vision algorithms to analyze urban change in a recent issue of the Proceedings of the National Academy of Sciences. "Computer vision methods can be used to detect and measure urban improvement and decline at the street block level," coauthor Nikhil Naik at MIT and Harvard University told Tech Xplore. "This data, in turn, can help us understand the causes and consequences of the change in public and private infrastructure of cities, as demonstrated in our work." The new study builds on previous research in which some of the same researchers developed a computer vision algorithm called Streetscore and trained it to rate the safety of an urban image by using a massive crowd-sourced dataset collected in 2011, called Place Pulse. In the new study, the researchers obtained images from Google Street View of five US cities (Baltimore, Boston, Detroit, New York, and Washington, DC) of the exact same location captured in 2007 and 2014, and then used a variant of the Streetscore algorithm to rate the safety of each image on a scale of 0 to 25. The change in the Streetscore rank of each location yielded a new metric, Streetchange. The researchers then validated the Streetchange scores using human assessments and found good agreement. When analyzing the Streetchange scores in combination with economic and demographic data, the researchers found support for three major theories of urban change. The two variables that were most strongly correlated to a positive Streetchange score were high population density and a high percentage of the population with a college degree. In accordance with economic theories of urban change, neighborhoods that are densely populated by college-educated adults are more likely to experience improvements in appearance. However, the researchers did not find any relationship between Streetchange scores and median income, housing prices, or rental costs, suggesting that the education effect is not economic but rather skill-based. Second, the analysis revealed that neighborhoods which look nicer to begin with experience larger improvements than less attractive neighborhoods do, in support of tipping models of urban change. At the same time, the researchers found that even the least attractive neighborhoods improved during this seven-year-period, and did not get worse as tipping models suggest. The third major variable contributing to a positive Streetchange score is being in close proximity to other physically attractive neighborhoods and to the central business district, in agreement with "invasion" theories of urban change. By demonstrating that computer vision methods can be used to support prominent theories of urban change and help identify factors that contribute to this change, the researchers hope that in the future these methods may play an important role in studying, understanding, and predicting the changing dynamics of urban environments. The real question is does this apply just to cities or to suburbs, which are naturally less dense, as well.